Patients commonly present to our clinic for removal of bothersome skin growths. While most of these growths can be effectively removed, the first step is always to make sure that the growth in question is not precancerous or cancerous. Sometimes the visual characteristics of the growth and its behavior over time allow a diagnosis to be made confidently. We will commonly employ a dermatoscope, a tool that magnifies and clarifies the appearance of skin growths, to aid in this process. In other instances, a biopsy may be necessary to ensure that the growth in question is nothing concerning. 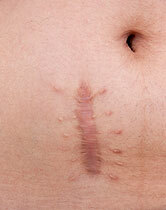 Insurance plans may cover the removal of certain benign growths while others consider these procedures to be cosmetic. Even in the case of medical coverage, it is important to understand that you may be held responsible for the full cost of a procedure if your “surgical” deductible has not yet been met. If there is any question regarding coverage, medical benefits, or deductibles, the diagnosis and procedure codes can be provided to you after your medical evaluation. Your insurance company can then give you an accurate breakdown of charges using these codes. If you have a bothersome skin growth, please make an appointment with a medical provider for evaluation and treatment recommendations.